Exclusive, Blow Out Pricing From The Craftsman Gallery. 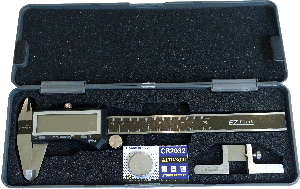 While supplies last, you can now order both the 6" EZ Cal digital caliper and the 6" digital protractor combination package, both quality iGaging products. You won't find a better value anywhere! 6" EZ Cal Digital Caliper This caliper has all the features you desire including zero setting, auto off, EZ View large display panel, relative A/B measuring, thumb wheel, hardened stainless steel body, IP54 water-resistance rating and uses a long lasting lithium battery. It even comes in a protective case and a spare battery. Use this rugged tool to measure inside or outside diameters, drill and router bit sizes, thickness of wood, width of a dado, and depth of a rabbet or hole. Measures in increments of .0005��, fractions in 1/128�� reduced to smallest denominator and .01mm. Plus you can add the handy wide-base caliper depth accessory for $5 more. 6" Digital Protractor And Ruler. This tool combines the best of two measuring tools� a set of stainless steel rulers and a digital protractor. The digital readout protractor has a measuring range from 0-360� and features a hold function and a reverse reading capability. You can set angles while transferring measurements. Use this handy tool to accurately set your miter saw angle or table saw miter gauge and blade tilt quickly, easily, and with absolute confidence. The rulers feature four sets of etched scales: 1/16″, 1/32″ & 1/64″ and mm. It too comes with a long lasting, extra lithium battery. Large, Single Number Readout Display Screen. Unlike analog calipers and protractors that rely on engraved scales only, the readout window on iGaging digital tools display a large, easy-to-read number. It eliminates the parallax problem where viewing, say, the scale of a ruler that can be misleading if your line of sight isn't dead on. With a large digital display, tired or aging eyes or imperfect lighting is no longer an issue. Watch independent review on YouTube. Click to view full screen.